Historic Dollhouse Restoration — Bernacki & Associates, Inc. 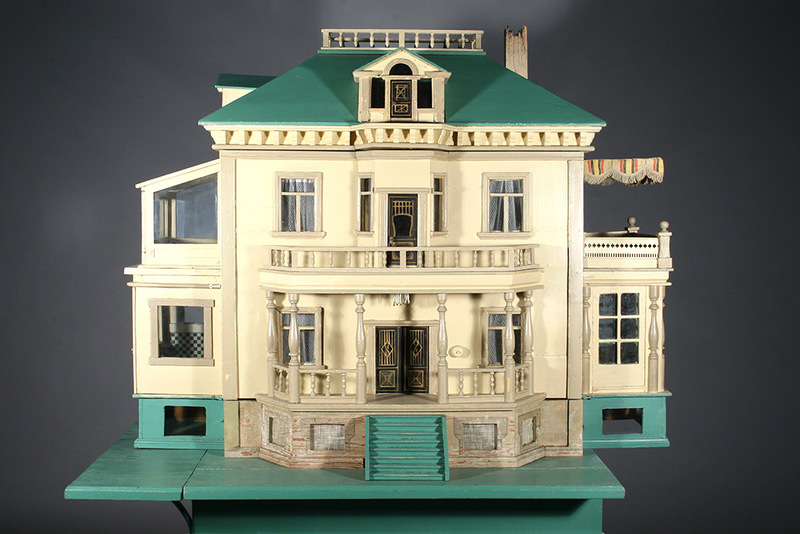 Historic dollhouses hold more than furniture. Passed from generation to generation, memories of childhood are contained within tiny rooms, halls, and staircases. 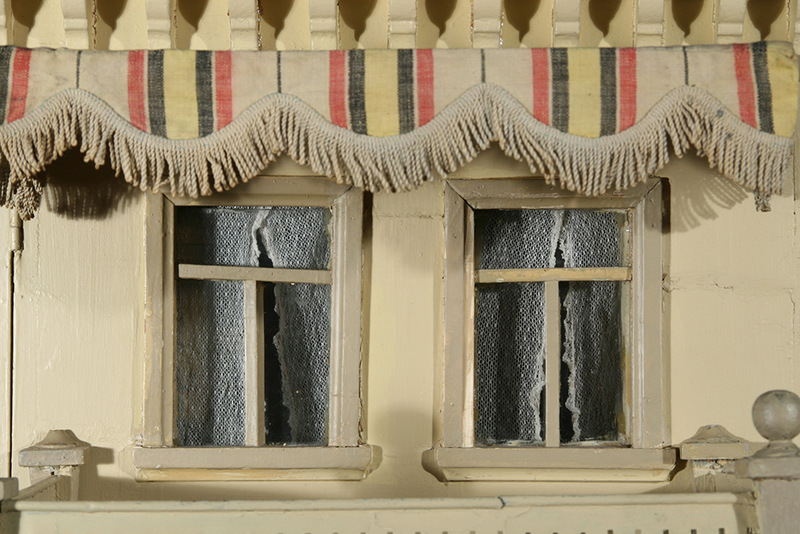 When those walls crack - as a Bernacki & Associates client in Kenilworth, IL noticed in her antique dollhouse - expert service can restore years of life to even the most delicate domicile. 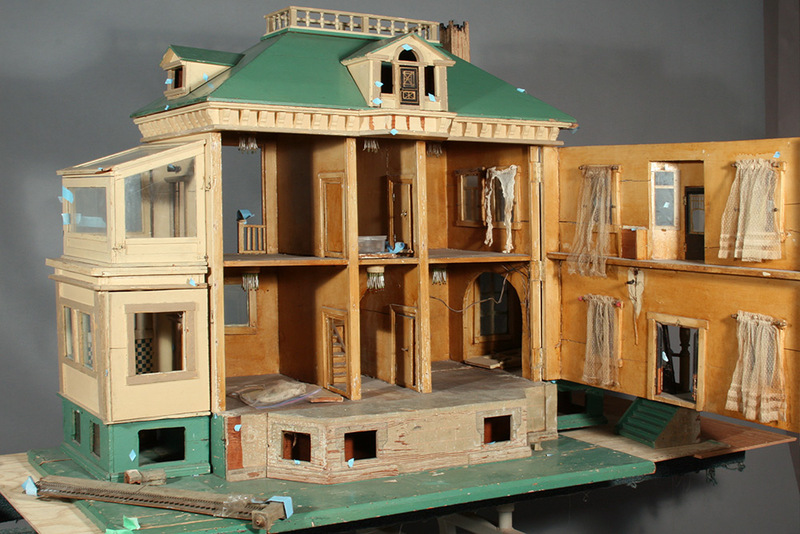 The wooden dollhouse was originally owned by the client’s parents in the early 1900s. Custom built by a local carpenter, it was intended to resemble the typical two-story Kenilworth home including basement, attic dormer, conservatory, and balcony with awning. Designed in the Victorian style, the miniature house was meticulously detailed with columns, spindle railings, and decorative light fixtures with original historic bulbs. Along with the house came a handful of furniture including velvet couch, chest of drawers, and art easel. But time had taken its toll on this once grand treasure. The dollhouse arrived at Bernacki with cracks and separations in its walls and base, loose and detached doors and decorative elements, cracked windows, and chipped interior and exterior paint, among other issues. Thankfully, the little house was in good hands. Renovation addressed the house’s structural stability by aligning and securing loose components. Lost architectural elements were re-fabricated, glass panes replaced, and a freshly cleaned awning installed atop the balcony. Even the tiny furniture received the royal treatment with custom fabrications created for missing parts. When and where was the dollhouse built? My grandmother and her husband lived in Kenilworth and commissioned a local carpenter to build it in the style of a typical early 1900’s Kenilworth home. It belonged to my mother who was born in 1919, and she and her siblings played with it throughout the 1920s and early 1930s. Was everything done by hand? Our family was originally from Germany and my grandmother and her husband grew up speaking German at home. They probably knew craftsmen in the German community who used a mix of old and new tools. Was the house previously repaired? No. But over the years, as the house deteriorated, all the parts were saved. When I contracted with Bernacki, I had almost all of the pieces needed for complete repair. Actually, there were a few mystery pieces left over after the work was done! What memories are associated with the house? I remember my brother once kept a pet garter snake that was around 2 feet long. One day, he reported it missing from its cage. It went missing for a while, but he finally located it curled up in the stairwell of the dollhouse! What is the importance of the house to you? My grandmother loved antiques and had a wonderful sense of style and design. She believed in living well, keeping a beautiful home, and enjoying wonderful home cooked meals. I remember her way of life when I see the house. Is the house currently displayed? Or do children play with it? The house is large, about 6 feet wide, 3 feet deep and 4 feet high. It takes up one side of a room. It has always been challenging to find the right space for it…sort of like owning an indoor elephant! When I was growing up, it was in our family room, losing a few pieces every year. The house is now in my living room next to my desk. I allowed my kids to play with it occasionally as they were growing up, but kept a second dollhouse nearby for rougher play. I bought new furniture for the kids to use in the dollhouses so the older, brittle pieces would not be destroyed. I have put some of the original furniture out now that Bernacki has restored the house so beautifully. It is waiting for my grandchildren to enjoy, but I will also keep the decoy house for them to use and I am really thrilled to have the dollhouse in good condition as an art piece in my home. 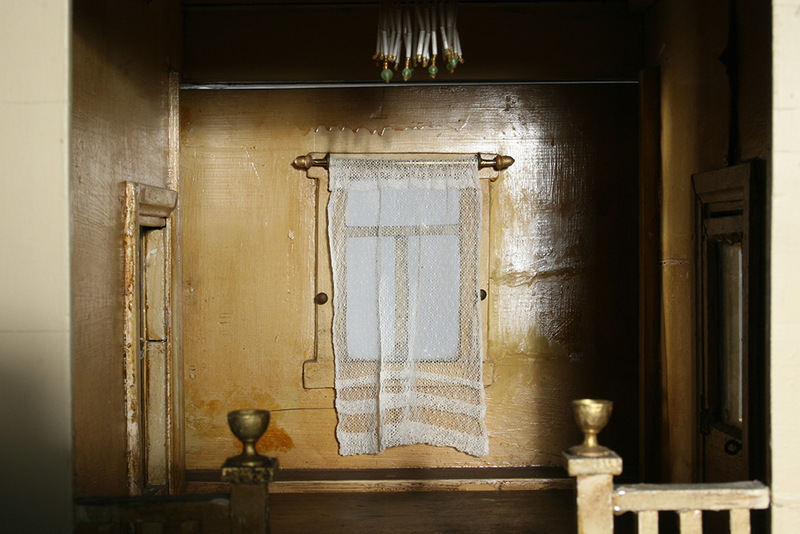 Photo: The historic dollhouse interior features original and working light fixtures, rail decorative moldings, authentic curtains and curtain rods, conserved bathroom wallpaper and appliances, and preserved wood floors throughout the entire house. All the doors have working hinges and knobs. The glass panels are all in place.